About Luxium Lighting - color-adjustable lighting for entertainment and architectural applications. Luxium is advancing the state of the art for color-adjustable lighting for entertainment and architectural applications. Human-centric illumination and control. With attention to quality and performance, Luxium designs and manufactures advanced yet easy-to-use entertainment and architectural lights and controls that improve the appearance of performances and enhance the experience for audiences by creating immersive, mood changing effects with color-adjustable smart LED lighting systems. Venues that benefit from Luxium lights include facilities where adjustable lights are installed for operation by lighting technicians and in temporary places where events, festivals, and performance are produced. Typical sites where entertainment and architectural lights are used include theaters, performance halls, worship centers, event centers, schools, restaurants, clubs, retail stores, galleries, landscapes, and more. Performance: Provide the highest quality and best designs to meet the needs of each application with attention on the right technology and ideal specifications for the intended use of the products. Sustainability: Strive to make and implement good policies and decisions that will contribute to efficient use of energy plus increased reuse and recycling of materials. Take actions to be a leader in reducing waste and unsustainable consumption of natural resources. Integrity: Assume responsibility and accountability for true honesty. Make reliable products that always exceed expectations and delight customers. Provide responsive support that both customers and stakeholders can rely on to help them achieve their goals. Amazing Performance: Luxium lights deliver more light output than other similar size event lights, all while using half the power. Offering smooth, full-range dimming and using exclusive additive-color LED lighting technology, Luxium lights produce stunning, richly saturated colors as well as subtle pastels — and even precision-calibrated white CCTs from 2200K to 6500K. Go Anywhere: Designed to make efficient use of space and energy, Luxium products come in different forms, from track fixtures with PAR flood lights to complete lighting instruments for theater grids and even to wire-free battery event lights. They’re quick to install any time, any place. Easy to Use: Luxium lights use advanced wireless control technologies, making set-up and operation quick and simple. Use the Bluetooth phone app to set the lights for the right color and brightness, either alone or in groups. Or, with DMX512 control enabled, the lights are ready for standard theater control consoles. Simple, powerful, and versatile. At Luxium, we are dedicated to making the most useful directional LED lighting products in the world. We bring together the most advanced technologies and ideas to make additive-color LED lamps with market leading efficiency and visual performance to rival professional theatrical lighting systems. While gels may still be used, they are no longer needed and with advanced blending of RGBCLW LEDs for an expanded gamut the Luxium color range surpasses what gel technology can offer and exceeds what’s possible with RGBW systems. All Luxium lighting products are based on innovative and unique light engine techologies that come together in a range of lighting instruments offering affordable theater quality performance for any occasion. Using the Luxium color blending light engine a full range of uniform and calibrated colors can be produced with additive mixing of individual LED colors. Luxium invented this RGBCLW (red, green, blue, cyan, lime, white) technology that can deliver more than 100 lumens per watt, the highest efficacy stage and entertainment lighting in the industry! 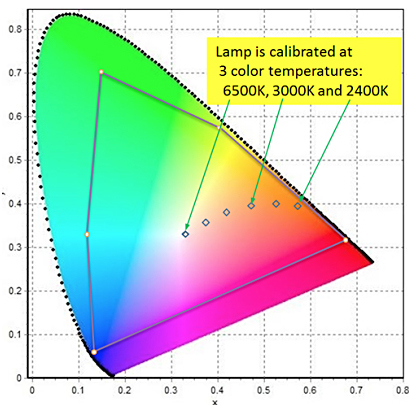 Calibrated Color: We tune each light engine to produce precise color points and intensities that are consistent from one unit to the next. 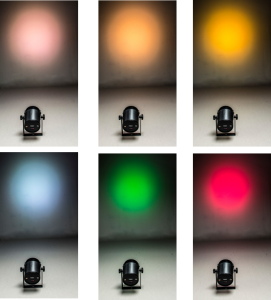 This makes it easy to have a lighting system where all the lamps output the same color. We also adjust the color temperature settings of every light to match the needs of many different application that benefit from specific CCT settings. This makes it easy to have high quality lighting that is easily adjusted to create the best look in a wide range of situations. Optical Path: We use precisely designed optical lenses, diffusers and materials so the light path is totally controlled to produce very uniform beam shapes with minimal scattering and low glare. This makes it easy to create perfect illumination for different scenes. The whole optical path has been optimized by selection of materials and design features to be economical without compromise of performance. This makes a total system that is low cost with high performance and long life. Thermal Management: An innovative use of sensors, smart control and efficient heat transfer features enables 50% more light output and by keeping the LEDs cooler, they last longer. Digital Dimming: We employ 16-bit processing in the Luxium LED engine for 100% to 0.01% dimming with no stepping or flicker to create smooth fades and color transitions using industry standard DMX512 control signals. This makes it easy for users to control lighting levels with high precision and make brightness level changes with standard control consoles. Luxium has more than 30 years of experience in optics and lighting technology to create products that are ideal for new installations or upgrading conventional light fixtures. We obsess over the quality and capability of our products while looking for every way possible to make them more affordable. We manufacture in the USA and make sure our lamps meet rigorous safety, reliability and quality standards. 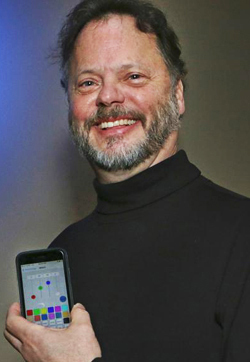 The Luxium business was founded in 2014 by serial entrepreneur Arlie Conner, who won “Innovator of the Year” while at Infocus and later co-founded Lightware and Lumencor. Arlie brings long experience as a technology manager with a high-tech heritage from the silicon forest of Oregon to the vision of using advanced light engine designs and controls to make theater quality lighting accessible to many venues. As a result, he has designed and taken to manufacturing numerous families of innovative lighting systems. Always seeking the best and brightest people and products, Luxium is making use of deep expertise in electronics design and manufacturing from around the greater Portland, Oregon area where the products are developed and produced.